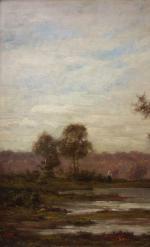 Extensive landscape in Fountainbleau, from where the author, important represantative of famous French Barbisone School Leon Richet (1847 - 1907) found motives for his paintings. Léon Richet was born in Solesmes (Sathe), Normandy in 1847 and he died in Fountainbleau (Seine-et-Marne) on May 26, 1907. He was a student of Narcisse Virgle Diaz de La Pena (1807/9-1876), Charles Victor Eugéne Lefébvre (1805-1882) and Louis Jean Boulanger (1806/7-1867). Diaz had the greatest impression on Richet and it is Diaz who history has remembered. There was a great difference in age between Diaz and Richet, which most likely explains the great respect on the part of the student for his master.uRichet began exhibiting in the Paris Salons in 1869. At the Salon of 1885, he was awarded honorable mention and he was awarded a second place medal in the Salons of 1888 and 1901. 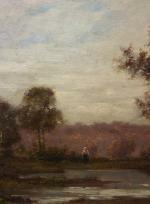 Richet’s best known landscapes are those set in the forest Fountainbleau where Richet depicts a figure on a tree-lined path or standing by a lake or pond. In these paintings we can very easily sense that, passionately inspired by Diaz’s work, Richet strove to capture the profoundly agrarian aspect of nature, and that he sought to study the effects of light in much the same way the Impressionists would do only a few years later. 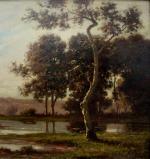 Like many painters of the 19th century, Richet traveled extensively. He painted in the countryside of Auvergne, Picardie, and seascapes in Tréport and as far away as Guéret in the center of France. He even traveled to Belgium. His subjects were not limited to Barbizon or the Fountainbleau forest. Richet wanted to record the nature and the effects of light on the diverse landscapes of his travels. Literature: E. Benezit, Grund, vol.VIII, pg. 742Thieme Becker LexikonIndex of Artists, MalletDictionnaire des Petits Maîtres de la peinture 1820-1920, Gérald Schurr & Pierre Cabanne, vol. I, pg. 336, illustrated pg. 337. Inscription: signed lower right, old illegible label with the name of the artist, mounted to the frame. Technique: oil on Mahagony wood. Luxuriously original period gold plated frame. Measurements: image w 18 7/8" x h 13 3/4" (48 x 35 cm); matted and framed w 29 3/4" x h 24 5/8" (75,5 x 62,5 cm). Condition: in good condition .